Derivan Artist Acrylic Paints are a professional range of acrylic colours designed to be water-resistant and lightfast. Equal in colour strength and permanency to most professional grades, Derivan Artist Acrylic Paint offers a more affordable alternative. 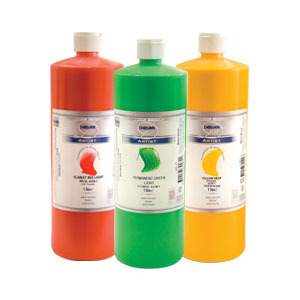 Derivan Artist Acrylic Paint gives fantastic results as a thick impasto paint or can be combined with mediums and water to work as a watercolour, screen printing ink, airbrushing ink or fabric paint.